It’s sunny here in Vancouver today. That is a gift in January in this part of the world. I received a call yesterday from another great leader in our industry. He was calling to tell me that he enjoyed yesterday’s blog post, and that in fact, he would like to share his catering success stories across his brand. It was a very important call for me on a personal level, because he went out of his way to tell me. 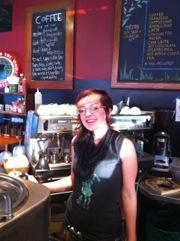 This morning, as I reflect on that over my cup of coffee, I took a picture of this Barrista, Larissa. Why you ask? Why was I inspired and where is the connection to this great leader that called me yesterday? Well, Larissa and I had a quick chat about being grateful for the things that we do have. Not to focus on our perceived problems, our “distorted realities”. Larissa, to me, reminded me of how lucky I am to work in the greatest industry in the world. Great people, that’s what it’s all about. Human connection. True and real relationships. Larissa is a stellar service person. She smiles every day, and always asks about my day. She smiles at me, tells me how healthy I look today and she reminds me to enjoy my day. So, I will do today what makes me happiest in my work. My favorite part of my job is working with all of you. I love working on your businesses, and I try hard to make all of our clients’ businesses as if it was my own. I love our industry, and today I Just want to focus on being grateful to all of you for taking your valuable time to even read this post. I love my team, love my work, love our clients and am humbled by the generosity of our multi-unit restaurant community. Larissa, thanks for the reminder today!